Appointments or Reservations are a set, reserved, scheduled time for your service. Barbers’ walk-in shifts are not listed in the appointment scheduler. Want to know when your preferred barber(s) are dedicated to serving walk-ins? See the schedule page. Appointments can be booked on-line via a link at the bottom of this page. 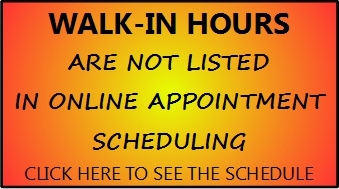 Our online booking shows all available time slots and appointments can easily be rescheduled or canceled online. See our FAQ for answers to questions you may have about appointments. We also offer walk-in service for those who prefer not to make an appointment. Appointments cannot be canceled on-line with less than 1 hour notice, you’ll need to call. Appointments canceled with less than 1 hour notice may be subject to $10 no-show fee. Please call if you’re going to be late BEFORE your appointment., there may be someone waiting in the shop we can serve instead (and you’ll avoid the $10 no-show fee). Program our number 773-880-9858 in your phone for easy reference. If you arrive even 5 minutes late, and you didn’t call, you may find your barber has started another customer. If you’re more than 5 minutes late your barber might not be able to serve you, and may request $10 No-Show fee. If you prefer to avoid the inflexibility of appointments, we have our walk-in option. We do our best to be on-time for our appointments, however, due to various factors like previous customers being late, extra time needed to perfect a haircut, (or unusually long lines at the coffee shop), we may be late for your appointment, especially at the end of the day. Thank you for your understanding and please allow some extra time. Color Appointments: Please consult with Zoran, Noah, Fernando, or Seanpaul regarding how much time to schedule. Don’t see the time(s) you want? Check back later- there may be cancellations. By clicking the button to schedule online, I indicate that I agree to the appointment policy.